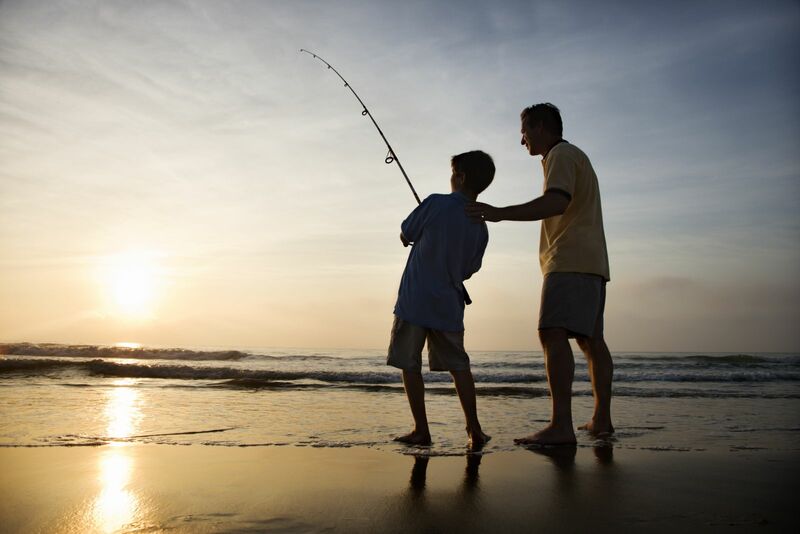 For generations, fishing has been a way of life on the Outer Banks. Watch the commercial fisherman bring in their daily catch on the docks of Oregon Inlet. Experience the thrill of reeling in “the big one” from a charter boat. Take the kids crabbing with just some bait and a string. Cast a line into the surf from the beach or from one of the many OBX fishing piers in the area. Fishing is a year round sport here, with different types available from Tuna to Spot to Flounder and Trout. Be sure to pick up a fishing license before you head out. You can get a license at any local Bait and Tackle shop or by following the instructions at the bottom of the page. Avalon Pier -- MP 5 in Kill Devil Hills. Open 5am - 2am in the summer months and 6am - 10pm in the off season. Cost is $8.00/adult per day or $40/adult for the week. Nags Head Fishing Pier -- MP 12 in Nags Head. The oldest and longest pier on the Outer Banks. Tackle Shop and Pier House Restaurant open for Breakfast, Lunch, and Dinner. Jennette's Pier -- MP 16 in Nags Head. Just re-opened in the Spring of 2011, the Jennette's Pier was heavily damaged by Hurricane Isabel in 2003. The NC Aquarium purchased it, restored it, and now operates the concrete pier as an educational facility with meeting halls and exhibits as well as tackle shop and snack bar. Outer Banks Pier -- MP 18.5 Nags Head. The Outer Banks Pier is over 600 feet long and open 24 hours a day. Tackle Shop and Grill are located on site, as well as video games for the kids and rental rods and reels. Guest of Atlantic Realty can enjoy fishing at the Outer Banks Pier with a complimentary pier pass with the included Fun N Sun Program!! Oregon Inlet Fishing Center -- Full service marina, public boat launch, and Charter Boat services located just 8 miles south of Whalebone Junction, just before the Oregon Inlet Bridge to Hatteras Island. Pirate's Cove Marina -- Located just before Roanoke Island, this marina offers Offshore Gulfstream charters as well as Near Shore and Inlet charters. Public boat launch avaialble nearby. Bob's Bait and Tackle -- Located in Downtown Duck and serving the northern Outer Banks for over 30 years! Visit their website for daily fishing reports, license, and charter boat information. Stop in for fishing advice, fresh and frozen bait, tackle, rod and reel rentals, T-shirts and hats. Visit the Wildlife Service Agent nearest you.